Arsenal manager Arsene Wenger responded to Manchester City boss Mark Hughes’ outburst over the absence of a handshake by blaming the snub on the alignment of the stars. On the eve of the superstitious Frenchman’s 500th game as Arsenal manager, the contact-avoider said the lack of a handshake was nothing personal against Hughes, just a case of ‘horoscope misfortune’. 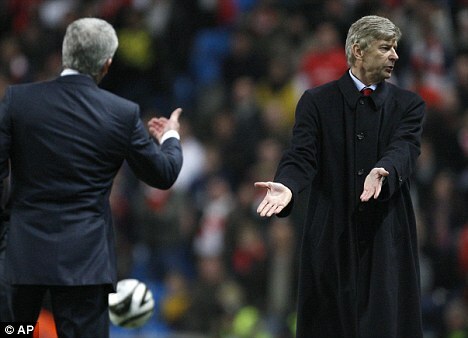 “I have been in charge of 500 games for Arsenal, and I have shaken hands 497 times. That’s just the way I chose to live my life,” mumbled Wenger. “It’s an ancient Wenger family tradition. It’s just unlucky that Hughes caught me on a day when the stars selected the 3/500 chance that I would not handshake. “One of the other times I didn’t handshake was when Prince Harry was guest of honour. I wasn’t shunning him, I just could not do anything about it. City boss Hughes refused to acknowledge the superstition excuse was valid, and was seething that the Frenchman bypassed the skin-touching exercise. “I always shake hands before and after I meet someone,” said Hughes. “And sometimes a few times in mid conversation. “You can never shake hands too much, there is no excuse. There is never an inopportune moment. “Last year, my house was burgled, and before I apprehended the villain… I thoroughly shook his hand. 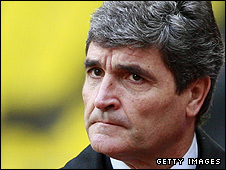 Hughes’ furious outburst over the lack of shakey-hand action sent shock waves through the Premier league. 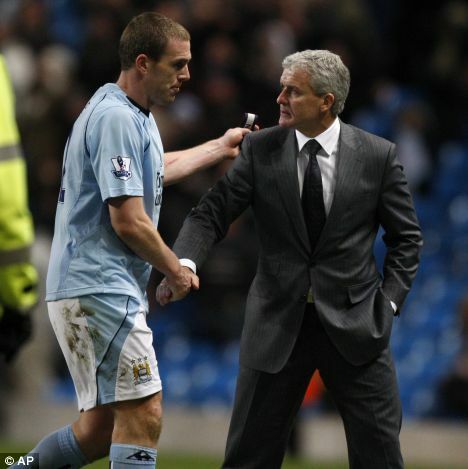 Before Chelsea’s visit to Eastlands, manager Carlo Ancelotti said: “Hughes’ intensity worries me. I will be shaking his hand at least three times before the game. The FAI are furious their proposal for Ireland to become the 33rd team in the World Cup was rejected after FIFA president Sepp Blatter refused to accommodate Ireland’s re-entry to the competition every single time they were knocked out. The Republic’s proposal suggested they should have special dispensation should they be eliminated by ‘clearly unfair naughty cheating,’ and automatically be replaced into the next round of the tournament. But FIFA president Blatter selfishly shot down the idea, and ludicrously suggested that if Ireland want to play in the finals they should resort to beating their opposition. “A 33rd team in the World Cup is a possibility, but I don’t think Ireland’s proposal is a feasible approach for football,” he may have said. “Their suggestion means they could unbalance the number of teams in a knockout phase, or even become a fifth semi-finalist on the basis that an offside went against them. When the FIA asked if video cameras could be implemented to stop Ireland being eliminated from future competitions, Blatter broke out in a sweat at the mention of technology and ran out of the room. 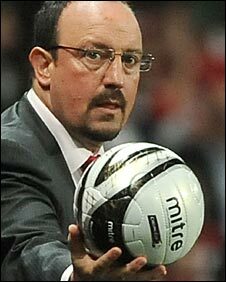 Liverpool’s board have insisted manager Rafa Benitez’s position is safe because not only does he owns all of the club’s footballs, but he has a contractual clause which gives him all rights to any football the club ever buys. Managing Director Christian Purslow must come to terms with either keeping the fiery Spaniard at Anfield, or have the club face a ball-less future. Purslow admitted that the hirsute hombre conducted clever contractual negotiations to get the ‘football ownership’ clause put in, and little did they know they would face this situation. The board are leaning towards backing the wily tactician to achieve some sort of consistency at the club, rather than face the prospect of winning the Premier League without a ball of their own. Bank of Southend, embargo embraced and more…. Administration-hit Southend United were given a life-line after finding out their only chance of survival lies in a government bail-out. But Southend fans are in dismay, because under new government subsidy take-over conditions, United would need to be re-classified as a bank. Supporters will need to apply for match tickets, but will be refused if they have outstanding debts or a bad credit rating. Want-away owner Mike Ashley has conceded defeat in his attempts to offload Newcastle United by stating his intentions to turn the club around, at least until he gets disheartened and changes his mind. As the fair-weather owner revels in the joy of being top of the league, he has forced Chris Hughton into taking the job he has always dreaded, the permanent manager position. 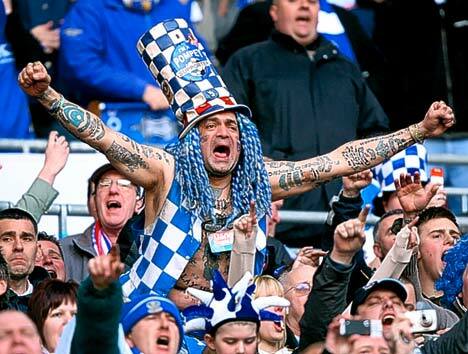 Portsmouth fans are rejoicing about the news that the club has been restricted with a transfer embargo. After Pompey’s transfer committee sanctioned some woeful summer signings, supporters took to the streets to celebrate the thought of not acquiring any more rough-tackling defensive midfielders, lower-division wingers or battering-ram strikers. Blackburn boss Sam Allardyce has denied claims that he plans to take the Premier League by storm by infecting every other team with swine flu. After two massive defeats against Arsenal and Chelsea, The Lancashire-based outfit are rumoured to be researching new biological-warfare approaches in order to eliminate their competition. “My scouting trip to the Libya had nothing to do with learning how to infect people with viruses, and my meeting with Colnel Gadaffi around the time of the outbreak was purely co-incidental,” he potentially pleaded. The devious Allardyce has a back-ground of underhand tactics, after achieving success at Bolton by brainwashing ageing superstars into believing they were still talented. But his mind-powers failed to convince his over-price imports that they had any ability while in charge at Newcastle, so it appears he has resorted to infecting opponents with contagious bacteria. Suspicions were confounded after an FA announcement that spitting on the pitch could lead to the spreading of swine flu coincided with El-Hadj Diouf being restored to the first team. After turning up late for Saturday’s match and releasing a statement on social-networking website Twitter which he was fined for, Hull striker Jozy Altidore has today released a YouTube vlog to apologise for his online outburst. The obsessive social networker has revealed he plans to work his way back in to manager Phil Brown’s good-books by making friends with him on Facebook, before serenading him with iTunes. Altidore’s tweet read “Apologize to all of you. I showed up late. Made a big mistake I’m very very sorry,” but the digital striker could face further trouble after he was allegedly seen on Vine, critising manager Phil Brown for double standards. “I’d rather not talk about it. This sort of technology has no place in football,” responded manager Phil Brown via Bluetooth headset. The uni-lingual globetrotter look disappointed, and then bemused when asked his thoughts on losing another job where nobody knew who he was or what he was saying. The misunderstanding occurred when Ramos’ interpreter was called to polish the plastic pitch, and Chairman Yestil Giner made the mistake of trying to converse with the stubborn Spaniard. The Russian-speaking chairman allegedly said: “It wasn’t that Juande struggled to get his instructions across, it’s just that he didn’t even bother trying to talk to the players, or anybody, at all. “The only person he spoke to was his interpreter, who didn’t even speak Russian,” added the oily oligarch. Ramos has apparently insisted that he will soon return to management, but is only interested in managing a non-Spanish club who fail to recognise the importance of communication.